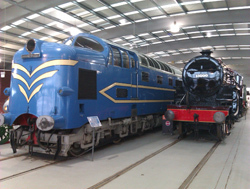 The 2017 RPG Convention was held on Saturday 13 May at the Locomotion Railway Museum (the National Railway Museum site in Shildon, Co. Durham). 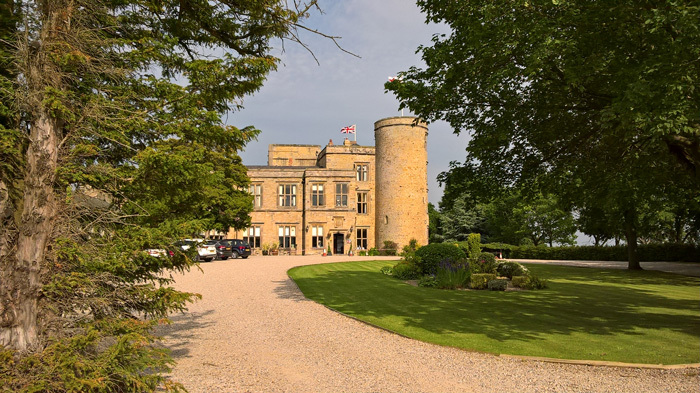 Most attendees arrived on the Friday night and gathered for a meal at the spectacular Walworth Castle Hotel nearby. The food was excellent, but we were seated at separate adjacent tables and this split the group up somewhat. We started the day with an interesting display from John Bathard telling us about how the railway Posts of Hungary and Romania were interlinked. This was followed by a Presentation in a Box from Roy Hardiman, telling us about the varied range of interests covered by the RPG. It is intended to refine this presentation and make it available to any member who wishes to give a presentation to local societies or groups to tell them what the RPG is all about (hence the title Presentation in a Box). For this Presentation in a Box (and for some subsequent presentations) we were able to use the Museum’s data projector to display slides on a screen (actually a plain wall). This enabled attendees to see things at a much larger scale, and in greater detail. It was certainly a big help, and something we will look to repeat when we can. The next item on the agenda was a preview of the new draft RPG web site, again using the data projector. A number of helpful suggestions were received on how best to take the draft web site forward. It is hoped to put the draft site live sometime this summer – watch this space. After a coffee break, the AGM came … and went … as AGMs do. Having said that, there was quite a bit of lively, interesting and useful discussion – enough to keep us all awake! At lunch time members were able to take an all too brief look round the museum, and the afternoon started with a look at the Mistakes, Corrections and Official Doctoring of TPO AM Postmarks presented by Ian Wells – an interesting subject which we rarely see much about (again with the help of the data projector). This was followed by a detailed exposé by Stephen Parkin of how mail was dealt with on routes in and out of edinburgh. Ken Mitchell also presented an overall view of the Postmarks of Railway Sub Offices; it is hoped to incorporate this display into the new web site. Then there were the competitions and swap shop (but not much material). However, we were fortunate to have a couple of Exchange Packet boxes at the Convention, and several members were able to find quite a lot of useful material. The Convention was brought to a close at about 5.00 pm, but this was not the end of proceedings. We were then treated to a real bonus! A couple of minutes’ drive away we were able to visit the site in Shildon where they are building a new G5 tank engine from scratch – mainly to service the insatiable requirements of the Preserved Railways. 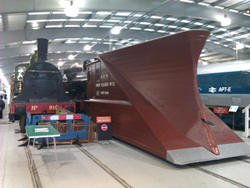 We were given a tour of the site plus a most enlightening lecture on why this particular loco was chosen, what the difficulties have been, and what the future holds. CLICK HERE if you want to read more about the G5 (opens the G5 web site page). Although this convention was a one-day event, most attendees stayed over at the Walworth Castle on the Saturday night. The food was again excellent, and this time we were seated at ‘joined up’ tables which made for a better social night. In short, the weather was great, the food was good, the hotel was superb, the surrounding countryside was lovely, the museum was fascinating, and the company was tip top – what more could we ask for? Finally, we must record our thanks to Jim Bryant (2017 Convention Coordinator) for putting everything together and giving us a wonderful time! If you weren’t there, you missed a very enjoyable day/weekend. 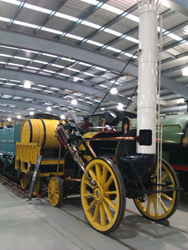 If you have not yet been to Locomotion, we can tell you that it is absolutely worth a visit!